Since 1983, Garners Food Service Equipment has been providing commercial kitchen design and installation services to an enviable and diverse list of clients throughout the UK. Garners came to JKE with an existing website that was difficult to maintain, expensive to run and not performing in the search engine rankings. 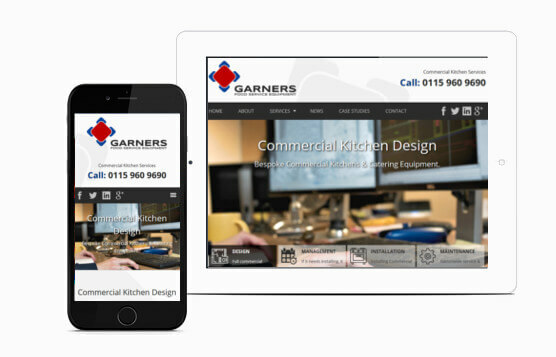 We worked closely with Garners to understand what they needed from a new website and got to work. With a solid brand already in place and a clear brief we created a website full of content in an attractive design that could be managed by Garners. Built with a bespoke WordPress theme Garners have full access to update content and add news articles and case studies. A fully responsive design which is now performing well in search engine rankings. Our SEO code foundations ensure the website performs well. All our websites are checked for page speed and meet all Google's mobile requirements.